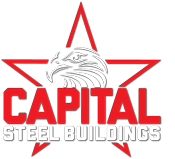 Whether it’s converting a vacant building into climate control storage or giving your old building a much needed face lift or re-purpose, Capital Steel Buildings, Inc. has the knowledge & flexibility to turn the old new again. Our American made components provide endless possibilities & improvements. Maximize the return on your investment by letting Capital Steel Buildings, Inc. design your next building conversion.